I am big fan of Death Note too. 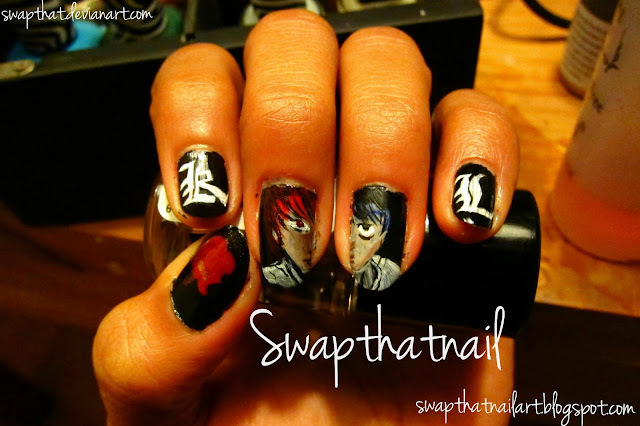 So as you can see thumb- Ryuk's apple , Kira's symbol, Yagami Light, L( my favorite <3 ) and L symbol. These all are made with use of acrylic. I hope you all like these nails. As a fellow Death Note fan (and L lover), I couldn't help but get overly excited at the sight of these!!!!! I love the shading you did on their faces as well as the composition of having their symbols and faces on each side. I can only hope to become as skilled as you are with acrylics on nails. I can't believe it took me so long to come across your work but I can say i'm so glad I did! I'm curious as to what future anime-inspired nail art you will accomplish. Again, absolutely love these! Keep up the fantastic work! Thank you so much! I am really glad that you liked it!Each word count! I would love to see your work though! :) May be we can learn from each other. Have a good day!